Mayor Andrew Ginther speaks to supporters for the Clinton/Kaine bus tour rally at the Fort Hayes Metropolitan Education Center in Columbus, Ohio on July 31. 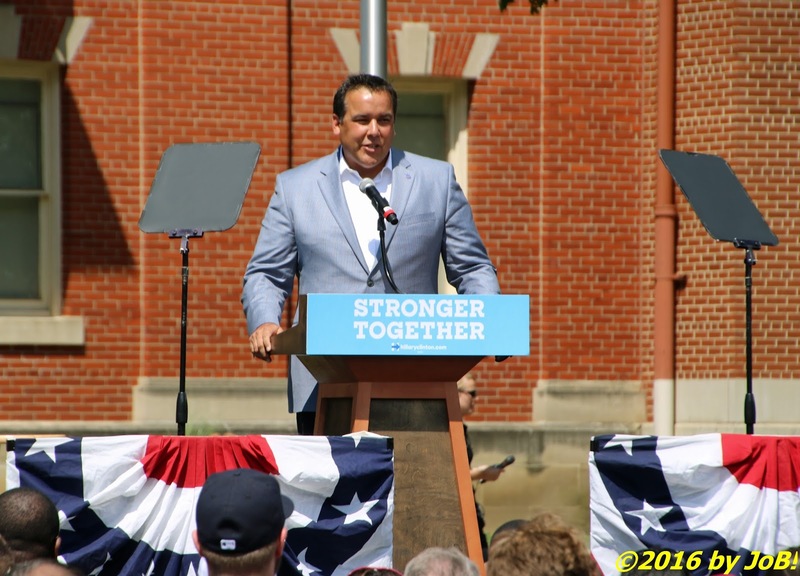 Braving a high temperature and heat index that caused around a dozen people to seek out medical attention, the attendees were received by two high-profile central Ohio-area Democratic politicians and Clinton/Kaine statewide leadership team members. Andrew Gintner, the city's recently elected mayor and three-term US representative Joyce Beatty provided exuberant endorsements of the nominees who were formally paired less than 96 hours prior to the rally. 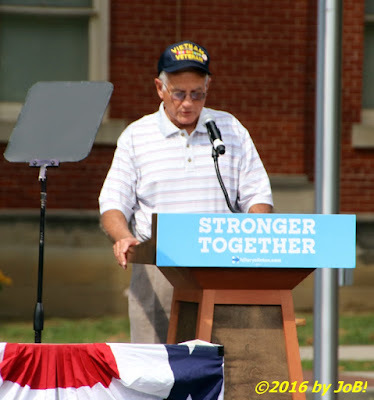 After a short delay to reconfigure the stage, Roger Teeters, a Vietnam-era veteran, provided introductory remarks and greeted Secretary Clinton and Senator Kaine as they alighted from the lead coach. 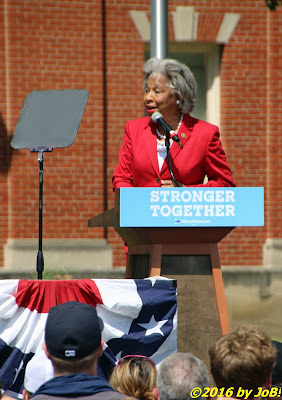 US Representative Joyce Beatty of Ohio's 3rd Congressional District talks to the crowd prior to the start of the Clinton/Kaine bus tour rally at the Fort Hayes Metropolitan Education Center in Columbus on July 31. Seeking to build upon the emotional high from their party's very successful convention, the nominees continued to attack their Republican rivals on several central issues. 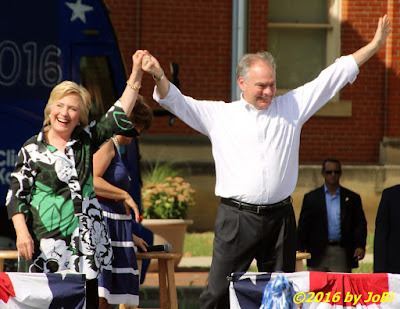 After outlining Donald Trump's dubious business record and details-lacking proposals for his presidency, Kaine stated "we cannot put a nation as great as the United States in the hands of an empty-promising, self-promoting, one-man wrecking crew. We just can’t do it, folks. We just can’t do it." Roger Teeters, a Vietnam-era veteran, introduces the Democratic presidential and vice presidential nominees to the crowd at the Fort Hayes Metropolitan Education Center bus tour rally in Columbus, Ohio on July 31. 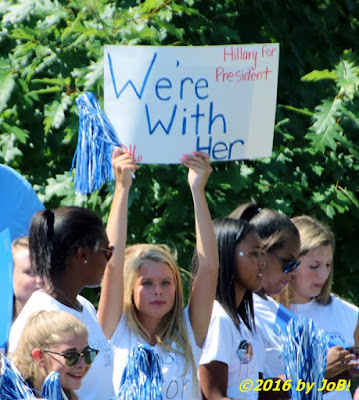 During her turn at the microphone, Secretary Clinton highlighted Mr. Trump's outsourcing practices that appear to run counter to the rhetoric from his stump speeches. "He makes dress shirts in China, not Brooklyn, New York. He makes furniture in Turkey, not Cleveland, Ohio. He makes barware in Slovenia, not Jackson, Ohio. And he goes around saying he wants to put America first and American workers first." 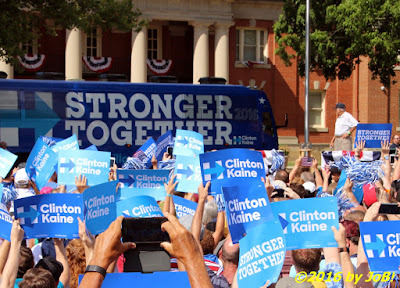 Several thousand supporters braved high heat and humidity levels to welcome Hillary Clinton and Tim Kaine to their bus tour rally at the Fort Hayes Metropolitan Education Center in Columbus, Ohio on July 31. 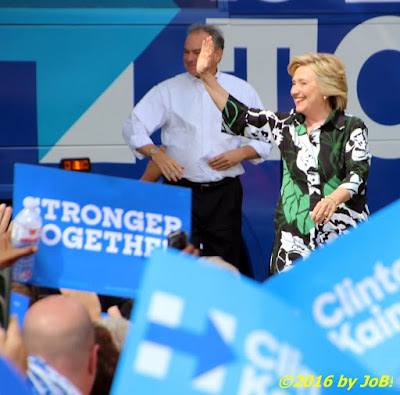 In addition to those economic issues, Clinton concluded her remarks by alluding to the then-brewing controversy regarding the Republican presidential nominee's comments about the parents of Captain Humayun Khan, an Army captain killed in Iraq in 2004 while protecting his subordinates, and their joint appearance at the Democratic convention. During an ABC interview conducted the day before the Columbus rally, Trump tried to defend himself against Khazir Khan's claims that he had never sacrificed anything in his life but the businessman made the situation worse when he suggested that Khan's wife Ghazala stood silently by his side and was not allowed to speak at the convention due to her Islamic faith. An enthusiastic crowd welcomes the arrival of the Clinton/Kaine buses for the nominees' rally at the Fort Hayes Metropolitan Education Center in Columbus, Ohio on July 31. Both Ohio and Pennsylvania are critical to each of the major party's Electoral College strategies. With a combined 38 votes in that quadrennial presidential selection process, they have gone to the Democrats in both 2008 and 2012 and recent polling trends shows the Clinton/Kaine ticket with a growing lead among likely voters in those states in the wake of the respective party's July conventions. Without them, the Republicans' attempt to secure the 270 electoral votes required to win the White House would be nearly impossible. 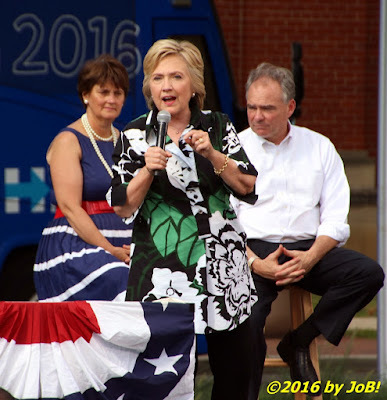 Democratic presidential nominee Hillary Clinton takes the stage while vice presidential nominee Tim Kaine watches on at the beginning of their bus tour rally at the Fort Hayes Metropolitan Education Center in Columbus, Ohio on July 31. 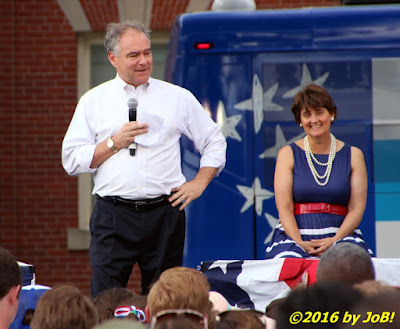 Democratic vice presidential nominee Tim Kaine addresses the supporters attending the Columbus, Ohio bus tour rally at the city's Fort Hayes Metropolitan Education Center on July 31. Sitting behind Kaine is is wife, Anne Holton. Democratic presidential nominee Hillary Clinton, center, speaks to the crowd for the Columbus, Ohio bus tour rally at the Fort Hayes Metropolitan Education Center on July 31. 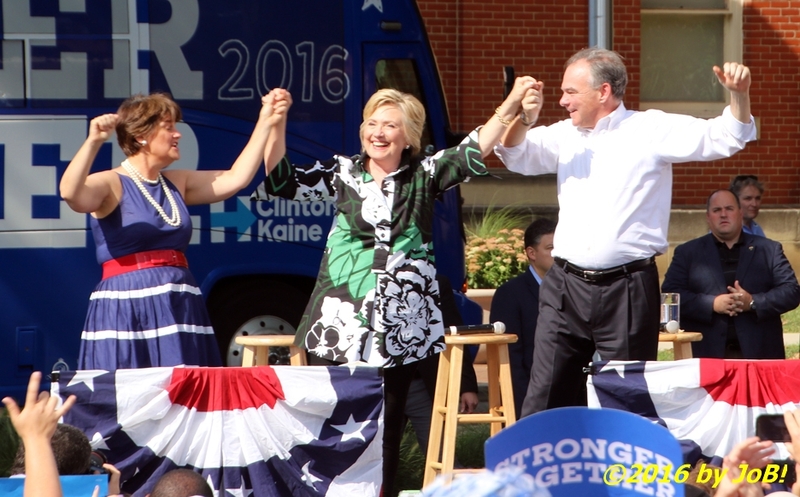 Sitting behind Clinton are her running mate Tim Kaine, right, and his wife, Anne Holton. 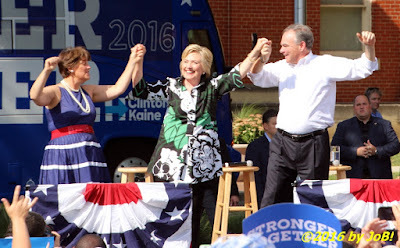 Democratic vice presidential nominee Tim Kaine, right, and his wife Anne Holton, left, lock arms with presidential nominee Hillary Clinton at the conclusion of their bus tour rally at the Fort Hayes Metropolitan Education Center in Columbus, Ohio on July 31. 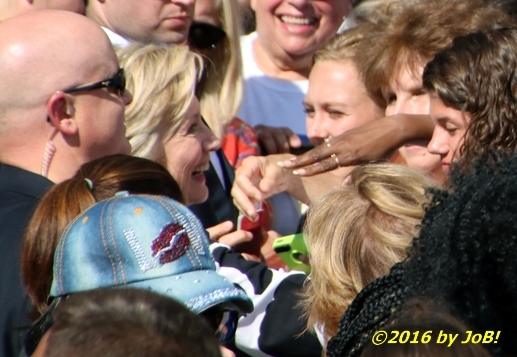 Democratic presidential nominee Hillary Clinton greets supporters at the end of the Clinton/Kaine bus tour rally at the Fort Hayes Metropolitan Education Center in Columbus, Ohio on July 31.